I have been in the studio this week creating new jewelry, and wanted to share this #Aura Crystal” bracelet. We have more styles coming in this necklace for Halloween as well. Also the Tangerine Orange Glow Lockets are good for this holiday too… of course we make them in all colors to match your costume of any type! Just message us what you need. 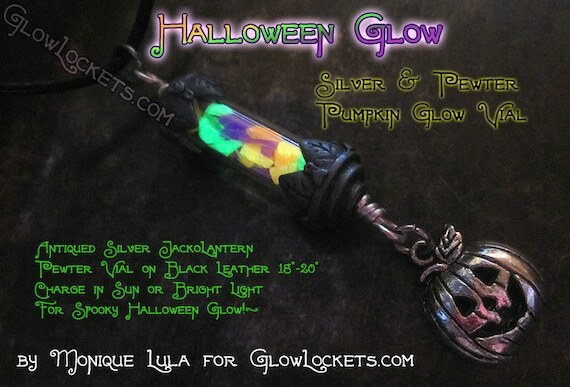 check out GlowLockets.com for latest glow jewelry. Our Original Glow Lockets ™ are now being worn in every state of America. All provinces and territories of Canada. Our glow jewelry is worn around the globe from our fans in Singapore, to Sweden, all the way back to the UK and Denmark! Just wear our glow in the dark jewelry in the sunlight for a few minutes and you will be amazed by the glow! Non toxic and safe to wear! Blue Star Glow Locket ™ is an adorable little but super bright blue star in a cage! Silver-plated necklace, makes a great gift! A really popular piece we have added is the introduction to the Rainbow Glow Lockets ™ which come in various sizes and styles and metals, but they feature a “rainbow glow” unlike any jewelry created before! New Orleans natives will find the Black and Gold Glow Lockets ™ to be a local treat! Whether you or a LSU or Saint’s fan you can surely feel the love for the great Crescent City! We are gearing up for more local jewelry shows and look forward to continuing to expand our line of professional jewelry. How about some fantasy-based jewelry? And finally if you like our Glowing Heart in a Cage necklace, we just added the matching Glowing Caged Heart earrings to go with it! Check out the Facebook page for contests and giveaways! The Original Glow Lockets ™ come in all shapes, colors, and sizes. We have many styles and glow colors. We are The Original Glow Lockets ™ and our jewelry is professionally made by hand.